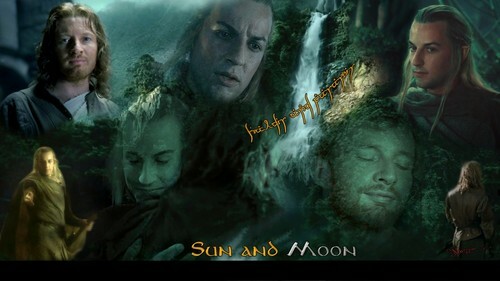 Sun and Moon - Haldir/Faramir. I changed the hugging shot and replaced Aragorn with Faramir for this wallpaper.. HD Wallpaper and background images in the el señor de los anillos club tagged: lotr lord of the rings haldir faramir. I changed the hugging shot and replaced Aragorn with Faramir for this wallpaper. This el señor de los anillos wallpaper might contain animado, cómic, manga, historieta, anime, and dibujos animados.